597 A.D. Treachery in Dark Ages Northumbria. Cerdic is the nephew of a great warrior who died a hero of the Anglo-Saxon country of Deira. Growing up in a quiet village, he dreams of the glories of battle and of one day writing his name into the sagas. He experiences the true horrors of war, however, when his home is attacked, his sister kidnapped, his family betrayed and h597 A.D. Treachery in Dark Ages Northumbria. Cerdic is the nephew of a great warrior who died a hero of the Anglo-Saxon country of Deira. Growing up in a quiet village, he dreams of the glories of battle and of one day writing his name into the sagas. He experiences the true horrors of war, however, when his home is attacked, his sister kidnapped, his family betrayed and his uncle's legendary sword stolen. Cerdic is thrown into the struggles that will determine the future of 6th century Britain and must show courageous leadership and overcome treachery, to save his kingdom, rescue his sister and return home with his uncle's sword. “I will take care of the body of my lord and you can carry the sword, story teller. For all good stories are about a sword.” The Northern Crown series follows the story of a young nobleman - Cerdic - as he lives through the darkest years of the Dark Ages. Through his eyes we witness the climatic events that forged the nations of Britain. For it out of this time that the English, Welsh, Irish and Scots races began to form: born in the conflict between Saxon and Celt, Pagan and Christian. It is well done for what it is. Very well written. The lower rating is entirely due to my personal taste, which does not run to copious detailed description of battles and death. I expect it would easily get 5 from someone with different preferences. CaptivatedKept my interest all the way. The story caught me up and kept me going on, this could have been the story of my ancestors. While not the caliber of Bernard Cornwall historical fiction, this is not a bad read. In fact, I may continue checking in on the various characters who were fleshed out well so the reader could create a bond with them. Of course not all the characters in subsequent books will show up. This is a story of war and conquesta price is paid in the form of human life. I'm a big fan of historical fiction, having read Bernard Cornwell's Saxon series, Agincourt and Sharpe series, I stumbled upon Richard Denning. 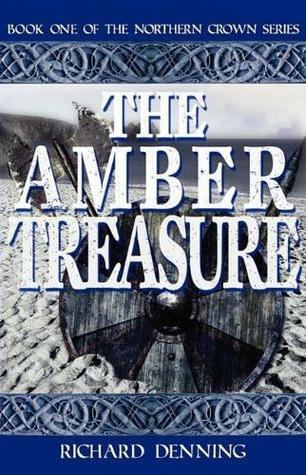 The Amber Treasure is the first book of his that I have read (or am reading) and I'm impressed. It is easy to see that this author has a deep knowledge of the history of Britain and this lends an authenticity to the characters that brings them to life. Have thoroughly enjoyed this book! Recommended for any fans of Bernard Cornwell. A nice coming of age story set in 6th century Britain that focuses on a group of young men who yearn for war only to find that it’s not as glorious as they thought it would be. Touching on love, friendship, betrayal and courage, it could easily be for a young adult. I enjoyed the story and cared about what was going to happen next but it was rather lacking in historical details. Interesting look into dark ages historyGood story telling, the tempo was kept up throughout the book. The look into the lives, loves, battles, courage, and politics of the dark ages was thought provoking. This a good clean read for young adults on up. War scenes, killing, blood, and violence present. Good story. It was mostly a tale of fighting armies through the eyes of the lord's son but still full of action. I would have rated the book a four star but there was little outside of the conflict to be interested in but still a good story. Fun book about the Britons and Anglo-Saxons in the 6th century. not much is recorded or known for sure about the happenings during this period, but the author weaves an interesting and believable story about the wars, people, and life in the age. On to book two - Child of Loki. History at its best!Denning has made obscure history come alive! Little is taught of the history of the Angles or the Welsh in England. This Brook foes DSO in an interesting and well researched yarn! This is the first book in a long time that I just couldnt finish. I got through five chapters before I had to give up on it. Because I couldnt finish it I wont rate it, it just might not be my cup of tea is all.